Sauvignon blanc is a green-skinned grape variety which originates from the Bordeaux region of France. 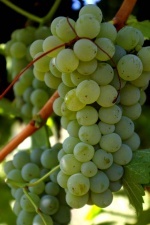 The grape gets its name from the French word sauvage ("wild") and blanc ("white") due to its early origins as an indigenous grape in South West France. It is now planted in many of the world's wine regions, producing a crisp, dry, and refreshing white varietal wine. Conversely, the grape is also a component of the famous dessert wines from Sauternes and Barsac. Sauvignon blanc is widely cultivated in France, Chile, Australia, New Zealand, South Africa, Brazil and California .